A rugged commercial grade built-in unit designed with features requested by professional chefs, the BI-36 from Crown Verity packs plenty of cooking space and nearly 80000 BTU's in a five burner system, but looks like it belongs in "the back of the house." 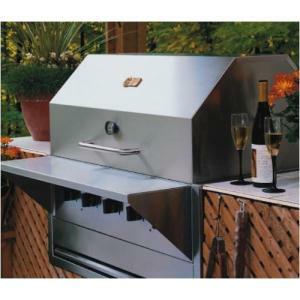 For homeowners who want a grill with good looks as well as function, it may not be the top choice. Be aware of what you get with this unit, because several features considered standard on home grills are only available as extra options on this grill. The heavy duty stainless steel hood and front shelf are two obvious examples -- a seller may imply they are part of the deal when they are not. The burner system is well-powered, with burner spreaders that even out the flames and heat up the entire cooking grid, while providing individual control of each burner for different cooking temperature requirements. This is a typical high production set-up and not built with energy efficiency in mind. Every accessory is extra. They are all well-built high capacity items, and there's a long list including a stainless steel wood chip box for authentic smoking, a very useful wind screen, and a rotissierie with the ability to turn 200 pounds of meat. For the homeowner, it may all come down to looks. Everything, even the extras, looks utilitarian, designed for a kitchen customers don't see. Your "back of the house" may be more public.